The OrganoSoftColors™ line are truly unique carpets that brings a style and luxurious texture never before seen. 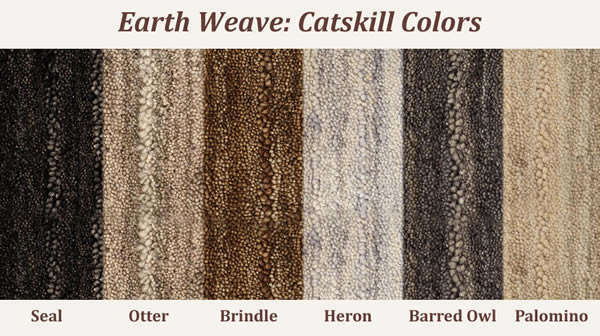 These carpets are manufactured with similar criteria to Earth Weave's venerable Bio-Floor line. As such, OrganoSoftColors has a natural backing system without toxic mothproofing or chemical stain protection treatments to promote clean indoor health for your family. The key difference is the development our organic dye process which we call OrganoSoftColors. The name is a play on all of the elements of this unique product—Organically Dyed, Luxuriously Soft, Colored Wool. The first product in this new line is Catskill: a chunky, variable texture, cut-pile. This product exudes softness and style with a look that is simply amazing. Once again, Earth Weave innovation has set new standards in the industry and offers uncompromising quality and health. See more pics of this beautiful carpet line!